the life of a vietnamese son-in-law | doberman pizza. Traditionally, the idea behind burning incense as an offering was to keep the spirit of the deceased warm, and also assure it of the family’s continuing love and devotion. In Vietnam, incense is burned almost continually in the first 100 days after a family member passes away, to ease their transition into the afterlife. After these 100 days, it’s said, the spirit of the deceased has come to terms with its fate and leaves this life to join its ancestors in the next world. 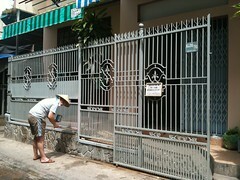 Apparently, the day after Quynh’s father passed away, the metal fence in front of the house was removed to make way for the flood of people who came to visit. It was welded back on afterwards, leaving black burn marks. Topping off my arsenal of filial practices, I put on a typical conical hat and went out to the front of the house to touch up the paint on the fence—which is now a nice, neutral, fashionable grey. Quynh’s mother Lam seemed very proud that I could take care of all of the chores I did—even though the only real barrier to me doing them was having someone explain what went where. In fact, she was so proud that she made it a point to mention it to any visiting relatives, so much so that in the first month I had already memorized the Vietnamese phrases for “make rice”, “take out garbage”, “go to market” and “offer incense”. Apart from receiving relatives at our home, we also went to visit relatives and neighbours a number of times. Despite feeling awkward about the language barrier, I tagged along as Lam introduced me (or reintroduced me) to friends, cousins, friends of cousins, cousins of friends. At the outset, I got the feeling of being paraded around, making me wish (fruitlessly) that I could somehow fade into the background and disappear. I’m still not sure I’ve gotten used to it. To her credit, I think Lam could tell I felt awkward, because she took the time afterwards to explain to me the point behind visiting the relatives. She said that when Hai was still alive, they would regularly go and pay visits to neighbours, friends and family; they would make it a part of their day-to-day activities, just to keep in touch. Throughout their lives, of course, they were always busy, and sometimes there wasn’t a lot of time to visit—but they still visited, even if only for five minutes at a time, just to let people know they were thinking of them. An honest culture of home visits. What more could you ever want from your in-laws? At one point, we went to the country to visit Quynh’s grandmother (Lam’s mother) and uncles/aunts, just to say hello before we went to visit Hai’s resting place. 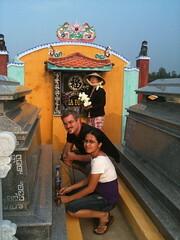 Her grandmother’s memory is very short, so when we visit, she often doesn’t remember us. She’s always very impressed to see me, though. The monologue usually goes like this: “A foreigner? A BIG foreigner? And he’s my granddaughter’s husband? Good job! !” She’s a remarkable, lovable character. Her short memory isn’t always a source of laughs, of course. It was painful for Lam to try and get across to her that Hai had passed away, only for her to drift off a few minutes later. As I’ve mentioned before, Lam was definitely the hardest hit by her husband’s passing, and I spent a lot of time during this visit to help her through it. Often times, this just meant hanging around, waiting to help with whatever needed taking care of. At the beginning, Lam was still so distraught that she had little motivation to take care of herself or the family—so Quyen, her sister and I had to do double shifts. In a way, though, I struggled to feel useful, since most of the time, I wasn’t actually doing anything, just sitting around in front of a fan waiting for something to happen. It was confusing at first. Still, I knew that that was the price to pay to make sure Lam was well taken care of and remained stable. She and I managed to have some frank conversations about depression and grief; I shared with her my experience of going through depression and coming out the other side a healthier, happier person. We shared like this several times, and I did my best to remind her that what she was going through was the normal process of grieving, and that yes, life would eventually get better. “I can’t see any future,” she told me one morning, to which I replied, “You will.” If there was any filial duty I performed that I found most important—more important than offering incense, painting the fence or placing rice on the shrine—that would be it: helping to restore hope after it was lost. Next post: the nature of prayer. This entry was posted in asia chronicles, baha'i blog, journal and tagged family, quynh, reflections, travel, vietnam by danger. Bookmark the permalink. I loved this post. It touched me very deeply as right now my family is also grieving the loss of a loved one. What I found most interesting is how you explained cultural differences is such a natural way that even though customs are different, it made me feel that we are all the same, all families are held together by this web of need, caring, patience, duty, respect, and just plain being there for each other. 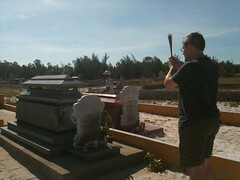 I also liked your delving deeper into the culture of visits. We are all trying to learn (actually, re-learn) this practice. Many of us only retain the part about visiting close family once in a blue moon and certainly very little about visiting extended relatives or non-relatives. We neither care for other people visiting us unannounced or want to visit others. We are so tired of the rat race we live and would rather sit at home and watch TV. Yet we are so lonely. Thanks again for being so truthful.